As we grow, the demands on our help and support team have increased. To continue to offer the best support we've enhanced how we log, track and respond to queries. You can now get support in more ways. Your support requests will get directed to the customer support team who always aim to get back to you within 24 hours. Whichever channel you chose, the more information and examples you can provide the better. Screenshots or videos also help a lot! You're already here so you know we have lots of articles on how to get the most from the Okappy system. We're always reviewing them and adding more information so this is the ideal first place to come. We've segmented the pages to follow the main sections of the Okappy platform. Alternatively, you can use our search functionality to find the information you need. Our community forum is a good place to ask questions and can be the quickest way to get an answer. It is split into three sections and has enhanced search so you can easily find answers to those question which may have already been asked. If a question hasn't been asked previously, there is a wide cross-section of users on the forum which means there is normally someone who can help. If not, our customer support team monitors and prioritise answers on the forum. The forum is also a good place to log requests for functions and features, as well as get tips and suggestions from other members. You can get in touch with us via the web and mobile apps. We have a dedicated support address which will is provided during your on boarding. Questions get logged and routed to the best person on the team. Finally, we have a dedicated support line available 24/7. They will take down your details, log the request and forward to the customer support team. As always, the more information you can provide the better, as this helps ensure your query gets sent to the right person and they have all the information they need to investigate. The number will be provided during your on boarding and depending on your account type. 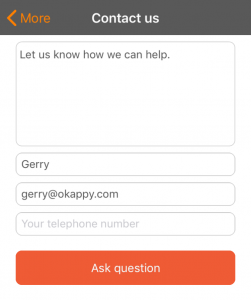 You can view the status of your support requests at https://support.okappy.com. You can add more information to your query and raise new tickets through the site. For access, please contact us and watch out for an email invite with your login details.